Are you feeling a little too overwhelmed seeing the little one in your arms? Are you not enjoying the bliss of motherhood? Are you feeling low despite having your little bundle of joy with you? If any of this is true, chances are, you could be suffering from postnatal depression. Falling into depression after giving birth is a very natural and common condition. Most women feel low as their hormones start returning to normal post-delivery. Your doctor may prescribe drugs to treat your depression. If you are nursing your baby and want to find out if these anti-depressant drugs are safe for him, this article may be of help. Postpartum or postnatal depression is a form of clinical depression that can affect you after childbirth. Symptoms may vary from drowsiness to irritability and lethargy. Some women may also have a hard time bonding with the newborn because of it. In most cases, postpartum depression may go off on its own after the first month or so. If the symptoms persist and you feel a constant gloominess, it is important to speak to your doctor (1). Your doctor will first speak to you and understand the possibility of you harming yourself or your baby to assess the severity of the condition. In some cases, your doctor may advise tests to check your thyroid levels. Hypothyroidism may also have the same symptoms as depression (2). If you are breastfeeding, then deciding to go for medication for your postpartum depression can be quite confusing. You want to safeguard your baby from any side effect the medicine may have, but not taking medication may worsen your condition (3). While recent studies suggest that not all antidepressants enter the breast milk, you need to be sure about what is safe. Some antidepressants may enter your breast milk, but leave minimal traces in it. Your doctor will be the best guide to tell you about the potential hazards of antidepressants. Drug name bupropion, brand name Wellbutrin. Drug name paroxetine, brand name Paxil. Drug name sertraline, brand name Zoloft. Drug name tricyclic antidepressants (avoid doxepin), brand name Elavil, Tofranil, Pamelor. Drug name barbiturates, brand name Fiorinal, Fioricet. Drug name lorazepam, brand name Ativan. Drug name oxazepam, brand name Serax. Drug name anticonvulsant, brand name Depakote, Dilantin, Tegretol (avoid ethosuximide, phenobarbital, primidone). Drug name citalopram, brand name Celexa – antidepressant (this can cause drowsiness in your baby). Drug name doxepin, brand name Sinequan. Drug name escitalopram, brand name Lexapro. Drug name fluoxetine, brand name Prozac, Serafem. Drug name venlafaxine, brand name Effexor. Drug name nefazodone, brand name Serzone. Drug name benzodiazepines, long-acting, brand name Librium, Valium, Dalmane. Drug name lamotrigine, brand name Lamictal. Drug name lithium, brand name Lithobid. 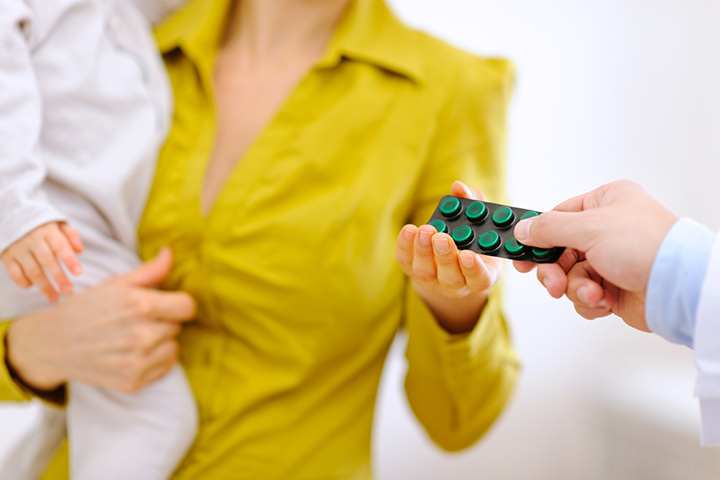 Even though your doctor may advise continuing breastfeeding, you may think otherwise while on antidepressants. If you are still not sure, you can stop breastfeeding for a while. Remember to use the ‘pump and dump’ method. It means that you pump out your breast milk and dump it instead of giving it to your baby. Doing so will ensure that even though you may stop breastfeeding temporarily, your milk flow will not reduce. Once you are off medication, ask your doctor when you can safely restart breastfeeding. Also, speak to your baby’s doctor about a safe formula feed that you can use in the meantime. If you have undergone treatment for postnatal depression, please share your experience and advice.